Though applications for traditional, two-year MBA programs are on the decline, colleges and universities are responding to consumer trends and improving how graduate-level course content is delivered. Indeed, recent trends indicate evolving attitudes about advanced business degrees. A number of top-tier schools have either shut down or are assessing the viability of their graduate business programs. Meanwhile, The Wall Street Journal reports applications for traditional, two-year MBA programs are on the decline. Many pundits blame high tuition costs and aversion to debt as reasons contemporary students are steering clear of conventional MBA programs. At the end of the business day, however, advanced degrees – including master’s in business administration, management and accounting, among several other areas – remain the ticket up the ladder and into the C-suite in many industries. What’s contributing to the demise of traditional MBA programs is business schools at colleges and universities across the country are responding to consumer trends and improving how graduate-level course content is delivered. Solution to shortage of tech professionals? More women! Generally, traditional MBA programs last two years, and many require students to attend a brick-and mortar campus and commit to their studies full time. The problem for a lot of midcareer professionals is their busy schedules simply don’t allow for a full-time academic commitment. Jobs, families and other responsibilities leave little wiggle room to even commute to class, let alone give all their time to learning. These days, technology allows universities to effectively provide instruction over the internet. For example, WGU Washington – the nonprofit, state-endorsed university based in Kent – offers MBA programs online. Plus, its pioneering competency-based model means students can study and learn on their own schedule and at their own pace – all for about $8,000 per year. Furthermore, one-year, part-time and executive programs are offered at many institutions – including the University of Washington – to help accommodate working adults. Whether taught online or in a classroom, almost all MBA programs offer theoretical and real-world training, and graduates emerge ready to contribute to their companies in many business-management functions. An MBA remains an excellent option for someone who aspires to become a generalist manager, CFO or division president. However, the growing acceptance of specialized advanced credentials is drawing more and more students away from traditional MBA offerings. Professionals with more focused areas of interest – including data analysts, tax accountants and integrated health care managers – are choosing master’s degree programs more closely aligned with their chosen fields. Recruiting business master’s graduates is a priority for 71 percent of employers. 58 percent of employers expecting to hire MBA graduates and 57 percent expecting to hire Master’s of Accounting grads plan on increasing their starting annual base salaries either at or above the rate of inflation. Nine of every ten companies surveyed have internship programs, and 66 percent of these organizations plan to offer internships to MBA candidates. While some traditional MBA programs may be in decline, an advanced credential in business remains meaningful and relevant in today’s job market. WGU Washington is an online, competency-based university designed to expand access to higher education for Washington residents. 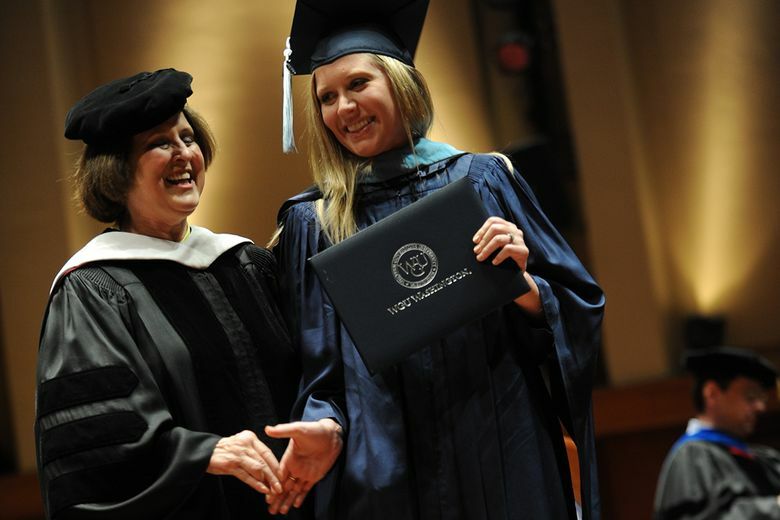 In 2011, the Washington State Legislature created WGU Washington in partnership with nationally recognized Western Governors University. Visit washington.wgu.edu.